I’ve never really considered myself to be a business owner or an entrepreneur; not because I didn’t think I was capable but because I never really gave it much thought. From the age of 15, I had always had a job because it was how I was brought up; leave school, find a job then retire. So when I officially launched my own business on 1 September 2017; it was a pretty momentous day and one I’ll never forget. When I finally made the decision to go self-employed from the design agency I was working at in July 2016, it was never with the intention of starting a business. I just wanted to freelance for a while so I could be around for my eldest daughter who was about to start school. However, 4 months into working for myself, I officially registered my business name, ‘Pink Lemon Branding & Design Ltd’ with Companies House. Have you ever tried to name your business? If you haven’t then trust me, it’s not the easiest thing to do! During the first year of self-employment, I was freelancing under the name of ‘Karen Davies Design’ which came about in 2012 when I started freelancing during my first pregnancy. It made sense to use my name. After all, it was me that was freelancing. However, once I had made the decision to start an actual business, I knew that I didn’t want my name to be a part of it. As far as I was concerned, if I was going to build a business, it would no longer be about me. When I first started working for myself, I picked up a lot of web design projects which I enjoyed. However, I encountered the same challenges throughout many of the projects I was commissioned to work on. Although Clients came to me for their websites, many of them didn’t have the right branding in place which made creating the websites difficult. I also noticed that there seemed to be a real lack of understanding amongst business owners when it came to branding their businesses. A lot of the content that I was seeing online wasn’t aligning with the businesses I was getting to know, creating a disjointed feel. Whilst I was at University, I developed a deep passion and understanding for branding. After all, any commercial design work starts with the branding at its core; it’s what drives everything. Branding isn’t just about the design aesthetics, it goes far deeper than that. It’s everything and anything relating to a company’s image, and not only includes the visual styling but also the language, tone and behaviour of a business. It therefore made complete sense to me to specialise in the area I was most passionate about. Once I had made this decision, the name followed shortly after. I must have considered over a hundred names but they were even taken or just didn’t fit the vision I was starting to form. I wanted something that referenced my girls as they were my ultimate purpose for creating the business. The name also needed to be creative and different as I didn’t want the business to simply blend in. Pink Lemon came about quite randomly but fitted perfectly. I adore the colour pink for its strong feminine qualities of love and nurturing, something close to my heart especially with having two daughters, and lemons because they are so full of goodness, flavour and zest! These are aspects I felt were fundamental to the core principles of my brand. Once I had the name sorted, the strapline ‘Adding zest to your brand’ came naturally to me, as this is in essence what I do. Once I had decided on my name and strapline, I then needed to consider my brand styling. I wanted to create something that had meaning and depth and that would resonate with my audience on an emotional level. In order to achieve this, I needed to go ‘under the hood’ of my business and really consider what I wanted to create. Of course, I didn’t have all the answers at this point but I did have a rough idea about how I wanted my business to be perceived which was a good starting point. I also needed to define who my customers were, why they would use my services and how I could provide solutions helping them with their business pain points. I also used Pinterest to create various mood boards to help create the style of design I felt fitted with my vision. This is such a useful exercise and one I recommend to all my Clients to do because it really helps to visual your thoughts and ideas. It took roughly 6 months to decide on my branding, mainly due to juggling a lot of Client work. I must have created countless amounts of logos, tested loads of fonts and colours but nothing seemed to work. However, what I soon realised was, that by knowing what I didn’t like, it helped me to narrow down what I did like. As a Designer, I often use my instincts to guide my decision process. I tend to get a feeling as to where something works or not; it’s a magical moment when design suddenly comes together. I really can’t explain it but it’s a powerful feeling that tells me that what I’ve done is right. That’s why I spend a great deal of time getting to know my Clients and their businesses. Once I get a flavour of what they are about, what they want to create, what their big vision is and why they are on this journey, I can create an identity that is more aligned with their overall goals. If I didn’t do this then the work I would produce would simply have no substance. I wanted my branding to be creative – for me that was the most important aspect of it. If I can’t be creative with what I do for my business, how could I expect Clients to pay for my creative services? I also wanted Pink Lemon’s branding to be unique, fun with a contemporary feel. I love colour so colour also had to play a big part in it. It’s amazing how powerful lemons are, they have so many healing properties and so I wanted to use this concept throughout my brand. Branding your business correctly can make a huge difference to the bottom line – it can heal it (see what I did there! ); it can actually make or break a business. It’s the branding that underpins everything both externally and internally which means that when you get it right, it can be very rewarding. I arranged my launch date for 1 September 2017 as I needed a specific date to work towards. One of the key things I had learnt during my first year in business was about goal setting. It’s one thing to have an idea, it’s another thing to actually make it happen. You need a plan, a strategy, that’s going to take you from point A to point B efficiently as possible. By committing to a date and making it public, it meant that there was no running away from it, I had to do it. I booked the 10 minutes speaking slot at my BNI Chapter as my official launch, scheduled a Facebook ‘Live’ and then proceeded to tell everyone and anyone who would listen. I then made a list of everything that I wanted to get done by that date such as designing and building my website, creating my business cards, leaflets and banner. I also wanted to have something I could giveaway so I chose branded cupcakes as I thought it would be a nice touch. I also ran a Facebook competition whereby someone would win one of my branding packages. This helped to grow my audience online and achieve exposure for the rebrand launch. I gave myself about 6 weeks to get everything in order which, looking back, was quite a challenge. I scheduled everything working backwards from the date of my launch. When the date finally came around, it was amazing. I’d worked really hard at defining what Pink Lemon was all about so when it came to talking about it, I knew I could do it with ease. 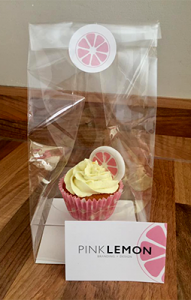 One of the questions, I got asked was ‘what is the difference between Pink Lemon and Karen Davies Design’… easy… Pink Lemon specialises in branding whereas Karen Davies Design simply provided general graphic and web design services. Through Pink Lemon, I get to niche and focus on the area I feel most passionate about. I am now a year on from launching Pink Lemon Branding & Design and I can honestly say all the work was worth it financially, professionally and personally. 1. Rebranding your business does take a huge amount of investment; both in time and in money but it’s absolutely worth it. 2. Defining your brand is critical. You can’t create branding without covering essential groundwork first. 3. Taking time to create a visual identity that best represents your business will help to demonstrate credibility, build trust and engage your audience. 4. Niche your services helps to narrow down your audience which then makes it easier to target. 5. Rebranding can have a huge positive impact on your bottom-line. If you are stuck in your business and feel that your message is getting lost in the void then it may be worth looking at whether your branding is in-line with what you are saying. It may be that you are attempting to speak to too many audiences as opposed to a selection of customers that will actually buy from you. When this happens, it can cause a disconnect. If you would like a review of your current branding to see if it’s right for you or not then please do get in contact here as I can help you.